In a meeting with a new customer recently, I was asked my opinion if they should train a new employee in-house or send the new hire to our training facility at Logics to be trained. Without hesitation, I recommended they send the new hire to our training facility. The full knowledge of any software product, especially complex utility billing systems, is vast and requires spending considerable time learning the application. 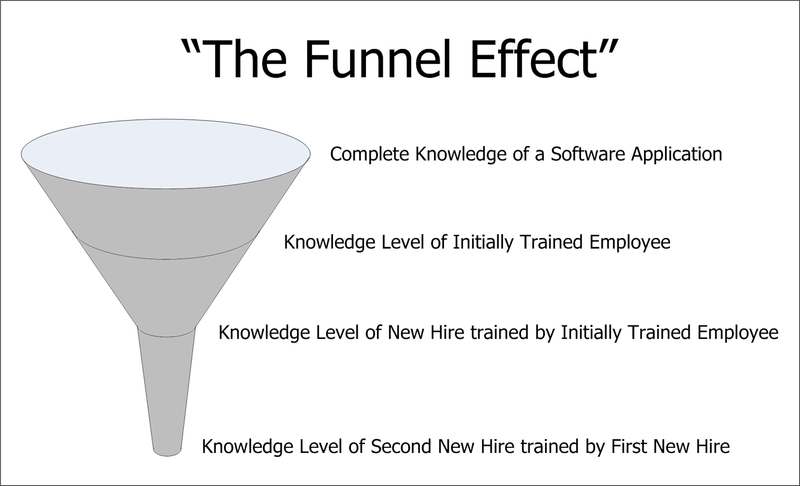 The top level of the funnel illustrates this full knowledge of the system. Even the most eager and attentive employees won’t retain everything they are taught during training. Initial user training generally focuses on the fundamental processes required to accomplish the basic functions in a software application. For example, with word processing software this training would focus on typing, formatting and printing a document. In the utility billing world this training would focus on updating accounts, entering meter readings, calculating and printing bills and posting payments. In a study titled “An investigation of training activities and transfer of training in organizations” published by Alan M. Saks and Monica Belcourt in the Winter 2006 issue of Human Resource Management, the authors report that 62% of employees apply training on the job immediately, 44% after six months and 34% after one year. As you can see, even immediately after training, the knowledge level of an initially trained employee is going to be considerably less than the full knowledge of the system. Going live with new software is often a chaotic experience and, especially while paralleling systems, the knowledge that is reinforced through daily activities is generally the basic function of the system. While some employees will take advantage of opportunities to learn more about the system, others will be content to learn only what is required to accomplish the day-in, day-out requirements of their job. Given the statistics in the previous section, an employee who is trained by a newly trained employee can be expected to retain only 38% (62% x 62%) of the full knowledge of the system. If the new hire is being trained a year after the initial employee was trained, the retention rate drops to 21% (34% x 62%)! As you can see from the previous section, with every employee that is trained by another employee, there is a resulting loss of knowledge of the system. By applying the statistics above to one more new hire, the best case scenario is a retention level of 24% (62% x 62% x 62%). In reality, the second new hire most likely isn’t going to be trained immediately after the first new hire. If the training of each new hire takes place a year after the previous employee was trained, the retention level drops to 7% (34% x 34% x 62%)! Who would you want training your new hires…? While we’re talking about training, what about your current employees? One of the types of training that we at Logics recommend for our customers is refresher training. Refresher training provides an opportunity for employees who are familiar with the daily operation of the system to review what they initially learned, hopefully being reminded of some features that they had forgotten about. It also provides the opportunity to learn more about the management and reporting capabilities of the system. I highly recommend refresher training. If you are a Logics customer, give your Account Manager a call to learn more about refresher training. Even if your software vendor isn’t Logics, I encourage you to contact them to see what additional training opportunities are available. If you have any questions about new hire training or refresher training, please give me a call at 919-232-2320 or e-mail me at gsanders@logicssolutions.com.